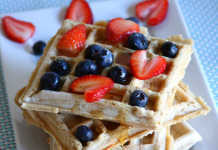 Vegan Blueberry Oats Waffles: When my husband insisted me to get the waffle iron, I kept rejecting it because I didn’t think that I would be using it quite often. I didn’t want yet another kitchen equipment to occupy my counter space. Boy was I wrong! The waffle iron has become one of the most frequently used appliance at home. I’m trying new waffle recipes almost every weekend. 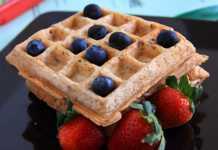 I got this idea for blueberry oats waffles from one of the magazines I was browsing. It was an usual waffle recipe with eggs, but I decided to make it vegan using my vegan waffle recipe. In a large bowl whisk together all the dry ingredients except the blueberries. In another medium size bowl stir together the milk and vinegar and set it aside for 5 minutes. Then add rest of the wet ingredients too. Fold in the blueberries. Pour the wet ingredients into the dry mix and stir together until well combined. Let the batter stand for about 10 minutes. 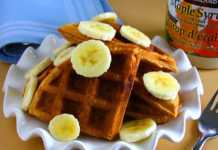 Grease the waffle iron with non-stick cooking spray and prepare waffles as per the instructions in your waffle manual. These vegan blueberry oats waffles turned out to be great. It looked lovely too with specks of cooked blueberries. The quantity of water depends upon the type of flour you are using. So start with 2 tablespoons and then increase if required. The waffles are not very sweet with the 2 tablespoons of maple syrup. But if you are serving it with maple syrup or other sweet sauce it should be fine. These were good! I left out the corn starch and used 1 cup oats and 1 1/2 cups of flour, and added a teaspoon of vanilla extract. 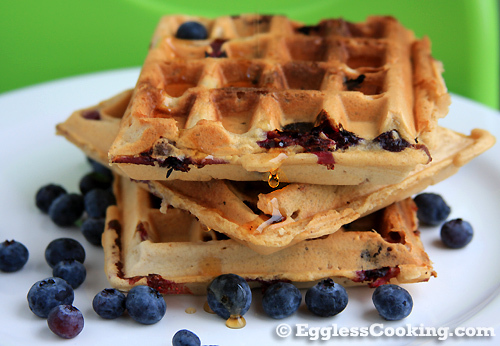 I also used frozen blueberries, so I folded them into the batter before making the waffles. Thanks for the feedback Margo. I am glad to have stumbled onto your site. Even though I am no Vegan, I am eager to try out most of your gluten-free and vegan recipes. Thank you for the opportunity and best wishes to you & your loved ones as well as to all your readers. Can I use sugar in place of maple syrup ? Yes you can, you may have to increase the quantity of liquid in the recipe. If I use normal milk then also apple cider vinegar is mandatory.